After installing the HubSpot-Salesforce integration, you can set up and manage the sync between HubSpot properties and Salesforce fields for contacts, companies, and deals. When you map HubSpot properties to Salesforce fields, they must have corresponding or compatible field types in order to sync properly. Each field mapping lists the field types of the HubSpot property and Salesforce field next to their internal names in parentheses. The following table shows the HubSpot property field types that can sync to Salesforce, their corresponding API names, and their matching Salesforce field types. The system in which the most recent value originates will overwrite the other system. This includes deleting the older value in either system. For example, if you change the phone number of a contact in Salesforce, this will overwrite whatever phone number exists for the contact in HubSpot. If you change the phone number of a contact in HubSpot, this will overwrite whatever phone number exists for the contact in Salesforce. HubSpot will only pass a value to Salesforce if there is currently no value in Salesforce. If a value exists in Salesforce, this value will always overwrite the existing value in HubSpot, regardless of where the most recent value originates. If you delete the value in Salesforce, the value will also be deleted in HubSpot. HubSpot will never pass data to Salesforce, even if there is no value in Salesforce. If there is a value in Salesforce, the value will always overwrite the existing value in HubSpot, regardless of where the most recent value originates. Data will never pass between HubSpot and Salesforce, regardless of where the most recent value originates. It's advised to select this rule for field mappings you want to ensure don't pass any data between the two systems. In the CRM Objects setting, click Manage mappings for an object. Please note: object sync must be enabled for Companies or Deals between HubSpot and Salesforce to set up company or deal field mappings. To create a new field mapping, click Add new field mapping. To edit an existing field mapping, click the settings settingsdownCarat dropdown menu and select Edit. To select an existing HubSpot property, select Choose Existing HubSpot Property, then click the Select a property dropdown menu and select a property. To create a new HubSpot property for the field mapping, select Create New HubSpot Property, then enter a name for the new property. Click the What Salesforce field would you like to map it to? dropdown menu and select the existing Salesforce field to map the HubSpot property to. Learn how to create custom fields in Salesforce. 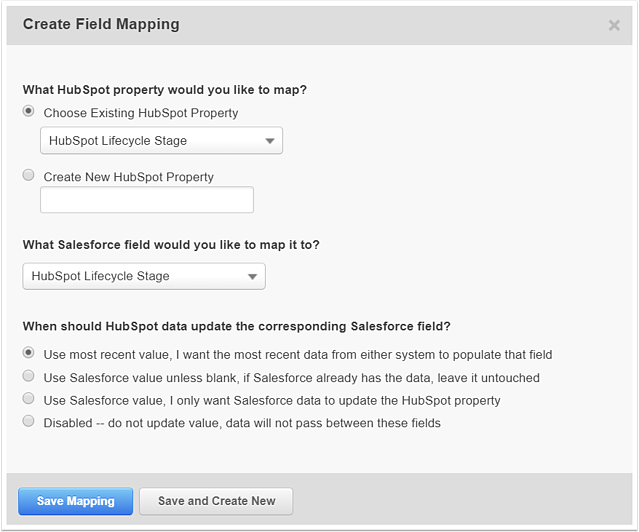 Please note: the HubSpot property and Salesforce field in a field mapping must have corresponding or compatible field types in order to sync properly. Under When should HubSpot data update the corresponding Salesforce field?, select the update rule to apply to the field mapping. Please note: there is a limit of 500 field mappings per object type (contact, company, and deal). When a field mapping has errors or needs to be updated, data may not be able to pass between HubSpot and Salesforce properly. For example, a HubSpot dropdown select property and Salesforce dropdown select field in a field mapping may have different values, or the field type of a HubSpot property or Salesforce field in a field mapping may have changed. Field mappings with errors or that need to be updated will be marked with a blue information icon info. To view the error or update details, click the information icon info. In the dialog box, follow the instructions (if applicable) to fix the error, then return to the field mappings screen. On the right of the field mapping, click the settings settingsdownCarat dropdown menu and select Refresh mapping. When a field mapping is refreshed, HubSpot will either update the mapping based on the steps you took to fix it, or attempt to update or correct it automatically. If you no longer want to sync data between a HubSpot property and Salesforce field in a custom field mapping, you can delete the mapping. Please note: only custom field mappings can be deleted in HubSpot. While standard field mappings can't be deleted, data syncing can be stopped by setting the update rule to Disabled. On the right of the field mapping, click the settings settingsdownCarat dropdown menu and select Delete.